Deedee's Digis: August Guest Designer - WELCOME JEAN! August Guest Designer - WELCOME JEAN! August is here and with that we say hello to a new Guest Designer: Jean Chaney! WELCOME JEAN!!! 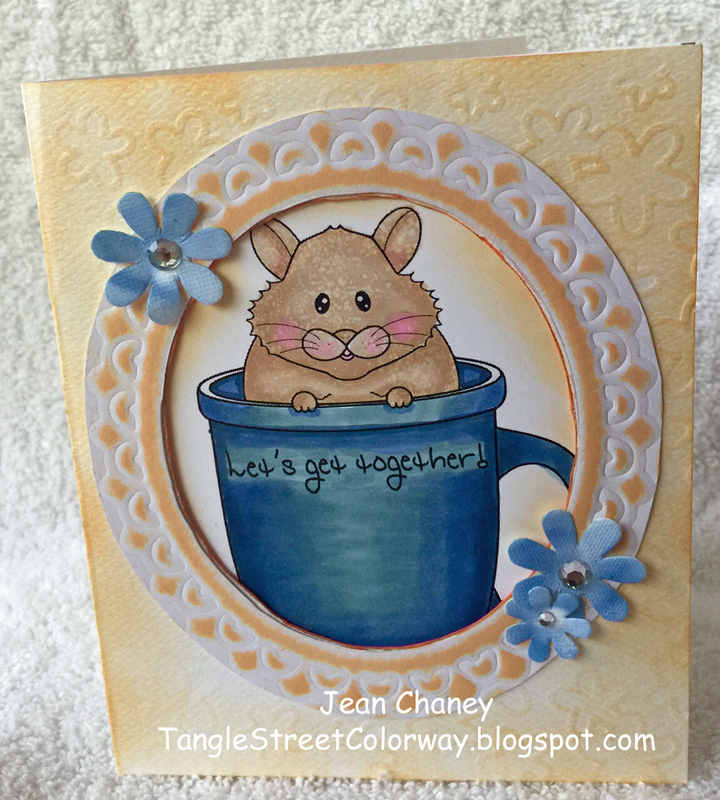 Jean is so talented - you will certainly want to spend some time on her blog: Tangle Street Colorway. But guess what? She has all sorts of parts to her blog - she has Tangle Street Journals and Tangle Street Studio for Zentangle. Jean is one super talented crafter!!!! Jean has always enjoyed exploring all kids of art mediums. Having been an elementary art school teacher for over 20 hears gave her lots of opportunities to play. When she retired she became a Certified Zentangle Teacher so that she could continue to teach something fun. She did do that and then expanded into becoming Copic and Spectrum Noir certified. She loves the online creative community and has THREE blogs for sharing each of her artistic interests. Be sure to check them all out - you won't be disappointed!!!! For her first project to share with us she used Coffee Cup Greetings and she put those expert color skills to use! What a cute little hamster!!! Why not grab a cup of coffee (or tea...or even a big glass of lemonade) and use Jean's card as inspiration to create something today? Stop by Tangle Street Colorway and leave Jean some love - she would so appreciate it and love to hear from you!!!! Come back and join us next Wednesday....Jean has a "souper" project to share! What a cute card and I love that image! Another item for my wish list!! I'm so happy to see Jean as your GDT--she is multi-talented and not only that, a very very nice lady!! So glad I know her!! How kind of you, Darcy. I really am enjoying working with Deedee's team this month and, goodness, do they have wonderful digis to work with!